Warriors and weeds (wild herbs) have been going together for as long as there have been men and women willing to pick up the stone, sword, or staff in defense of their kith and kin. Some weeds, we shall call herbs from here on out, have been utilized not only as a nutritional aid, but to help in performance enhancement, and even synthesized into poisons to assist in hunting and fishing for the tribe. In the world of the warrior injuries are a natural part of the path they walk. From minor bumps and bruises, to cuts, sprains, strains, and gushing gashes. Plants have been there to aid in the healing of them all. One of the most common, versatile, and well-known of them all is Yarrow or Achillea Millefolium, its botanical Latin name. The Latin name for the plant, is actually derived from the Greek hero Achilles. 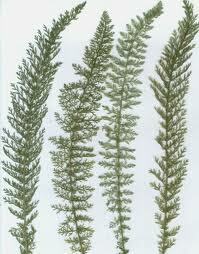 Historically, the plant was used to treat war wounds during the Trojan wars. In Classical tradition, Homer tells us that the centaur Chiron, who conveyed herbal secrets to his human pupils, taught Achilles to use yarrow on the battle grounds of Troy. Achilles is said to have used it to stop the bleeding wounds of his soldiers. In fact this anti-hemorrhaging action is exactly what Yarrow is best known from. It has many names such as: soldier's woundwort, ,arrowroot, bad man's plaything, carpenter's weed, knight's milefoil, soldier, soldier's woundwort..and nosebleed being the most common. The leaves have been used to staunch the flow of a nose bleed. Yarrow is a very valuable and versatile medicinal herb, with much scientific evidence of use in alternative medicine as an antiseptic, antispasmodic, astringent, carminative, diaphoretic (increasing perspiration), digestive, emmenagogue (induces or hastens menstrual flow), stimulant, and tonics, vasodilator (blood vessel dilator, opens vessels) and vulnerary. Yarrow is used against colds, cramps, fevers, kidney disorders, toothaches, skin irritations, and hemorrhages, and to regulate menses, stimulate the flow of bile, and purify the blood. Medicinal tea is a good remedy for severe colds and flu, for stomach ulcers, amenorrhea (the abnormal cessation of menstruation. ), abdominal cramps, abscesses, trauma and bleeding, and to reduce inflammation. Traditionally, it was used for three types of ailments: applied topically, for wounds and minor bleeding; to reduce inflammation, especially in the digestive tract; and to alleviate anxiety or insomnia (as a sedative). My personal experience and relationship with Yarrow has been a dramatic one. On the weekend of the 4th of July I went fishing and wanted to make fish-balls for my 3 year old daughter. Once I returned I started to prep by sharpening my fillet knife with one of those one-handed hand-held knife sharpeners, and wouldn't you know I missed on one of the strokes and sliced my index-finger wide open. Luckily I did not sever any ligaments or tendons. But watching yourself inflict that sort of injury on one's self is traumatic to say the least...I now know I could not be Yakuza. It hurt like the dickens and I could have used stitches. 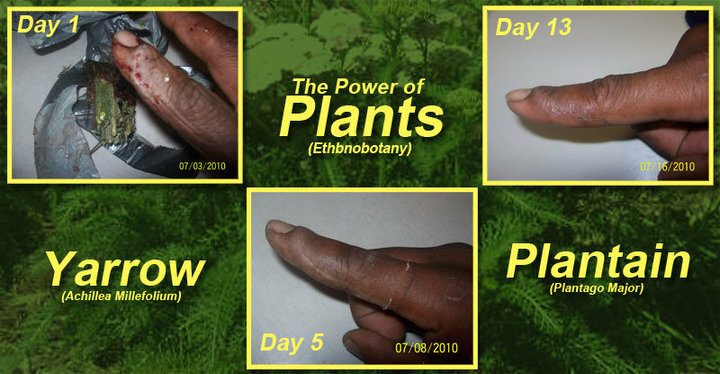 I immediately applied Yarrow I had drying in my herbal section of the kitchen and wrapped it around my wound with duct-tape for two days., then added Plantain (Plantago Major) for another two...then just used a salve I made of both yarrow and plantain. pretty much now the cut is almost completely healed. No stitches...not trips to the ER...no inflated medical bill...no infection..and no lost of finger! Lastly, Yarrow is a very effective insect repellent. Mosquitoes do not stop buzzing around you but, they do stop biting. So as a resident of Minnesota, whose state bird IS the mosquito ;-) and I, being outside a lot. 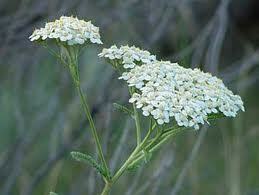 Yarrow is a cheap and effective alternative to DEET. And of course, it is a good after bite remedy as well. Next time, I will share some recipes and rendering techniques that I have used as well as recommended dosages. Stay tuned!